3 -- Number of teams that have repeated as tournament champions since 1999. Russia last did it in 2009 and Canada did it in 2004 while the Czech Republic won three straight between 1999 and 2001. With the Helsinki crowd behind them, Finland has a chance to join that group, which would be the first time the Finns have ever won consecutive World Championships. 4 -- Modern record for most assists in a period, set by Mats Sundin in 1994 against the United States. This year, Morten Ask of Norway matched that record in a 12-4 win over Germany, assisting on four straight Norwegian goals. 13 -- Number of goals the Czech Republic has scored in three international games against Slovakia, which they will play in the tournament semifinals. In those three games, the Czechs have outscored the Slovaks 13-3. They last played in the 2010 Olympics in Vancouver, a 3-1 Czech win. 13 -- Number of medals [10 gold, two silver, one bronze] won at the World Hockey Championship by Vladislav Tretiak with the Soviet Union, the most all-time. 15 -- Number of players on the Finnish roster, including captain Mikko Koivu and goaltender Petri Vehanen, who played on the 2011 squad that won gold. 16 -- Career goals scored in the tournament by John Tavares, who at age 21 has passed Ryan Smyth for seventh all-time in Team Canada scoring. Tavares reached that mark in 20 World Championship games, compared to 61 for Smyth. 20 -- Points scored by Dany Heatley in 2008, the highest single-tournament total for any player in the last 20 years. With 15 points through eight games, Evgeni Malkin is within reach of Heatley's total and has already passed last year's total for Finland's Jarkko Immonen, who led the tournament with 12 points. The modern record for points in a tournament was set by the Soviet Union's Vladimir Petrov, who scored 34 points in 1973. Minus-25 -- The tournament-worst goal differential for Italy, which will be relegated after finishing last in the Stockholm group. While the Italians did manage an overtime win over Denmark, they were shut out five times in seven preliminary-round games, losing by a combined score of 22-0 in those games. 36 -- Shots on goal for Finland in the first period of a match against Latvia at the 2008 Worlds, a tournament record. This year, the low-scoring Finns managed more than 36 shots in an entire game just once, firing 48 shots in a 4-1 win over Kazakhstan. 40 -- Age of Czech forward Petr Nedved, who became the oldest player to make his World Championship debut for the Czech Republic. The former NHL player competed for the Czech Republic at the 1996 World Cup after representing Canada at the 1994 Olympics. 202 -- Tournament record for combined penalty minutes in a single game, set by the United States and Finland in 2008. 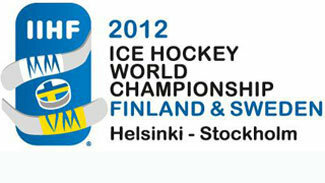 Heading into the 2012 semifinals, Canada led the tournament in total penalty minutes with 131.